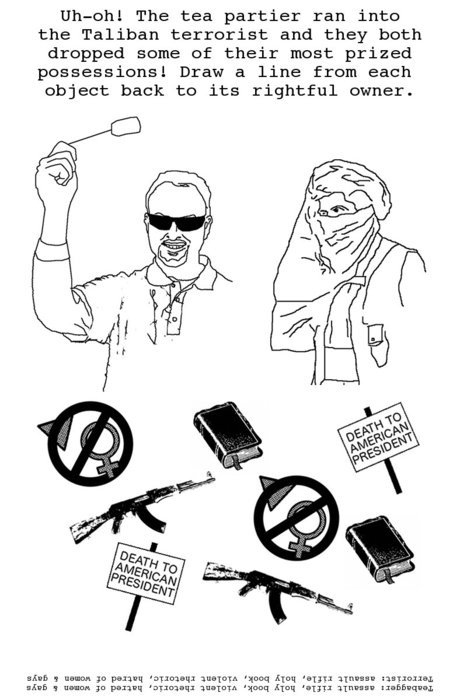 US Tea Party, Unindicted Co-conspirator of Oslo Terror Attacks! Is President Obama a secret Muslim? Is Sharia law the radical scourge that’s threatening the very fabric of U.S. democracy? Contrary to the saying, a lie repeated often enough won’t make it true. But that doesn’t mean anti-Muslim activists, armed with millions of dollars of foundation support, won’t stop trying. It turns out a handful of seven donors have given nearly $43 million over the last decade to fund a close network of right-wing intellectuals and scholars who’ve concocted and fanned Islamophobic hysteria to push an anti-Muslim political agenda. According to “Fear Inc.,” a new report released by the Center for American Progress, those millions have gone to a coordinated network of anti-Muslim thought leaders: Frank Gaffney at the Center for Security Policy; David Yerushalmi at the Society of Americans for National Existence; Daniel Pipes at the Middle East Forum; Robert Spencer at Jihad Watch and Stop Islamization of America and Steven Emerson of the Investigative Project on Terrorism. This network, with millions of dollars behind it, has moved an agenda that seeks to pit Islam against the West, that imagines Muslims as untrustworthy and dangerous, that has painted Muslims as a looming threat who are out to undermine American democracy and national security. And with the help of activists, right-wing bloggers and a platform from a more than obliging cable news system, these fringe ideas have become more and more mainstream. “There is a coordinated, strategic, deliberate, interconnected agenda here, which has very detrimental effects on fellow Americans and our communities and which really poisons the well of civil discourse,” says Wajahat Ali, the lead author of the CAP report. “We’re living in a post-9/11 environment so what the network does is very cynically exploits fear, hysteria and misinformation and ignorance for the sake of profit, and for the sake of pushing an anti-Muslim agenda under the guise of allegedly combating radical Islam and protecting our national security,” Ali said. It’s in this post-9/11 climate that the most absurd statements have become commonplace in the mainstream political discourse. It’s the kind of extremist thought leadership that has paved the way for Rep. Peter King’s congressional hearings on the supposed Islamic radicalization of the country. They’re the authors whose anti-Muslim rants were cited dozens of times in the Oslo, Norway shooter Behring Breivik’s manifesto. These are the people who’ve singlehandedly brought anti-Sharia laws to over a dozen statehouses. They’re the machine that’s given rise to the idea that Obama might secretly be Muslim, and that were that true, it’d somehow be a terrible offense. Ali says that the success of this messaging rests in part on the fact that 60 percent of Americans claim not to know any Muslim person, and so people rely for on mainstream media and the words of political leaders for information. The anti-Muslim rhetoric firing across the airwaves and in congressional hearings has real-life impacts, too. It’s provided the political cover for a whole slew of policies that have targeted Muslim, Arab, Middle Eastern and South Asian communities. An AP investigation published last week uncovered a years long domestic surveillance program that the NYPD had undertaken to gather information on Muslim communities. The invasive surveillance measures meant that New York police had broad powers to monitor, harass and racially profile New York Muslims. “Muslim-American organizations and the vast majority of individuals that we interviewed firmly reject the radical extremist ideology that justifies the use of violence to achieve political ends,” David Schanzer, an associate professor at Duke and the director of the Triangle Center on Terrorism and Homeland Security, said in a statement at the report’s release. And this week a new report from the Pew Research Center found that American Muslims are concerned about the exact same things everyone else is: they take national security seriously and are distrustful of extremism in many forms, even as they report being unfairly seen as suspect themselves. American Muslims overwhelmingly have both, Pew reports, “mainstream and moderate” attitudes. Nevertheless, in the last decade, Muslims, Arabs, Middle Easterners, South Asians and those who’ve been confused for any of the above, have been the targets of a marked rise in job-related discrimination, hate crimes and biased-based bullying. Billoo said that since September 11, it’s not uncommon for American Muslims to be confronted by anti-Muslim incidents in their daily life, the the utter frequency of which have begun to normalize Islamophobic rhetoric in even her community members’ eyes. Ali said he hoped the report would give these funders an opportunity to assess their political priorities and distance themselves from the obvious fearmongering that they’ve funded. He said that the U.S. needs to learn from its past mistakes and regain its moral compass to bring some moderation back to the national discourse. * This article has been updated since publication. What do we really know about Anders Behring Breivik, the Norway mass murdererwho killed in the name of his anti-Muslim ideology, nearly a week after his horrific rampage? We know what he did, and why he did it: he left behind not only a 1,500 page manifesto, in which he pours out his hatred of Muslims, but also a day-by-day diary that details his elaborate preparations, in which he claims his crime was nine years in the making. That’s an awfully long time for a “lone wolf” to keep his plans to himself, yet the head of Norway’s intelligence agency was quick to state Breivik acted alone – this is spite of Breivik’s own contention, in his online “book,” that two other cells of his “Knights Templar Europe” exist. Furthermore, according to Breivik, the Knights were founded at a London meeting in 2002, at which his British “mentor” and representatives fromacross the continent were in attendance. “After school, Breivik did a brief stint in the army, and then appears to have gone from one job to the next. He is believed to have started a computer company and earned enough money to live in a luxury apartment and sport a Breitling watch. However, other reports suggest that for years he worked in a lowly call center and lived almost anonymously. There is no online record of Breivik’s “E-Commerce Group AS,” as far as I can see: an odd happenstance for an e-commerce outfit, wouldn’t you say? As for Brentwood Solutions Limited, there is no record of those guys, either: however, there is a Brentwood Solutions LLC in Naples, Florida. In any case, what I want to know is how did Breivik manage to get his hands on the equivalent of nearly $115,000 added to his account in 2007? If the money was legitimately earned, then why hide it in Caribbean and Eastern European banks and why go through “unorthodox” procedures in order to sneak it into Norway? Okay, now let’s summarize what we know about Breivik’s money trail, based not on what he says in his diary but on what little investigative reporting has been done on the matter. It boils down to this: His tax records show a small income in 2007 – the year all that money miraculously appeared in his bank account – and a bit more in 2008. He had no reported income in 2006 and 2009. Prior to that, there is no evidence of his “first million” anywhere to be seen. However, we can see in the reaction to his murderous assault a kind of support network that has sprung up, if not to defend him personally then to defend his motivations and the ethos from which his hatred welled up. As I have said in myother columns on this subject, the so-called counter-jihadist milieu – whose writings were copiously cited in the online manifesto – provided the theoretical basis for Breivik’s horrific actions. The “anti-jihadist” pro-Israel blogosphere played an important role in reinforcing and elaborating Breivik’s crazed worldview, and there is even some frightening evidence that they played more of an activist role than that. “Before, I thought about emigrating to Britain, Israel, USA, South Africa, etc. for taxes and politics, but instead (although I believe we are the very last generation on earth before the return of God) I will stay and fight for the right to this country and indeed the entire peninsula, for the God-fearing people, just in case this isn’t the end of the world after all. Doesn’t hurt to have a backup plan. “It’s far from impossible to achieve, after all my people has done it every time before, in feats that match the ancient Greek, hebrew and british ‘legends’. “Oslo and the southeast may fall easily, but there are other lines than ‘state’-borders drawn across this country since long before there was even a single muslim in the world, and we have held them this long, against everyone else too. We are entering a new golden age for my people, and those of a handful other countrys, but only through struggle. So here is some nut stockpiling “weapons, ammunition, and equipment,” because “this is going to happen fast” – with Geller’s enthusiastic encouragement. Indeed, she’s so concerned her correspondent might be arrested that she’s protecting his identity. Who is Geller’s mystery correspondent – is it the same Norwegian nut-case who ruthlessly cut down dozens of children, or a different one waiting in the wings to do the same? Come on, Pamela – clear up the mystery. Or would you rather continue to shield your fellow “counter-jihadist”? I wouldn’t be at all surprised if the leaders and “scholars” who provided Breivik with the intellectual and political support he needed also provided more substantial support, such as ensuring the confidentiality of communications with the “Knights.” Geller has already gone on the public record as supporting the thugs of the English Defense League, who troll the streets of British cities looking for Muslim victims – why not Breivik? Never has a “lone wolf” had this much company.